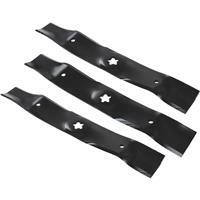 Husqvarna 48" Blade Set Part# 532-180054 is a mulching blade set for Poulan Pro and Husqvarna riding mowers with 48" cutting decks. This set is used on Model No. 960430182 Husqvarna lawn tractors. Please check your owners manual to assure that this is the correct set of blades for your mower model.